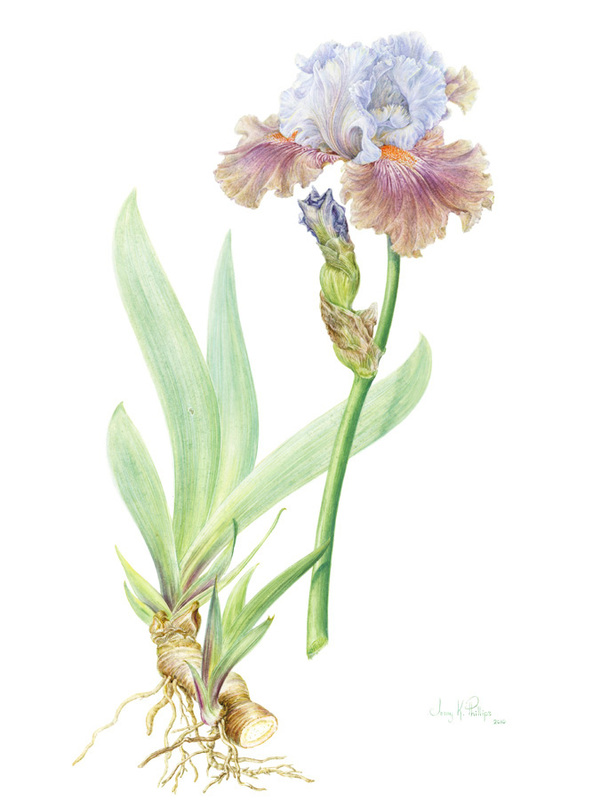 Hybrid Bearded Flag Iris, watercolor on vellum and in the artist’s private collection. © 2015 Jenny Phillips, all rights reserved. 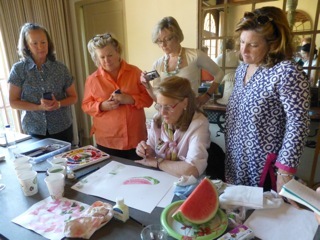 Jenny Phillips, internationally renowned botanical artist and teacher, is returning to Southern California to teach watercolor. Sponsored by the Virginia Robinson Gardens, Jenny will be teaching two workshops in two locations: one at the Virginia Robinson Gardens in Beverly Hills; the other at The Huntington Library, Art Collections and Botanical Gardens in San Marino. Participants may sign up for one or the other, or both. Jenny runs the Jenny Phillips School for Botanical Art in Melbourne, Australia, and has taught in America, Europe and Africa. Jenny is known for her attention to detail and in her teaching, shares her expertise in helping everyone — from beginning to advanced students. She furthers understanding of the art of botanical painting by giving demonstrations of her methods, tips and the benefits of her experience. Her magic with a paintbrush, her techniques for correcting “mistakes” are well known and her enthusiasm is contagious. All who take her classes come away with a renewed energy and thrill of painting nature. For more information, contact Tania Norris. Jenny Phillips discussing techniques at Virginia Robinson Gardens. Fee PER WEEK $595. for Virginia Robinson Garden and Botanical Artists Guild of Southern California members. Non-members $625. per week. A $100 non-refundable deposit or payment in full will reserve a seat in the class. Remainder payable in full, one week before scheduled class. A supplies list will be sent to all registered participants. Coffee, tea and water will be provided, but please bring your own lunch. Lunch at The Huntington may be purchased from the Café or coffee shop. To make reservations for the class held at Virginia Robinson Gardens, visit the Virginia Robinson Gardens online; call 310.550.2068; or mail a check to: Friends of Robinson Gardens, 1008 Elden Way, Beverly Hills, CA 90210. Jenny Phillips demonstrating techniques at the Virginia Robinson Gardens. To make reservations for the class held at The Huntington, please mail a check made out to Tania Norris: 137 N. Larchmont Boulevard, Los Angeles, Ca 90004. For more information about either session, please contact Tania Norris. Jenny Phillips, a Gold Medalist from The Australian National Print Awards 1998, The Royal Horticultural Society, London 1993, and recipient of the Celia Rosser Award, has focused her drawing, watercolour skills, and love of gardening on botanical art since 1971. She is a renowned botanical artist and one of the most popular and experienced teachers. She has her own Botanical Art School in Melbourne, Australia, and has her paintings in many notable collections, including that of H.R.H. Prince Charles. 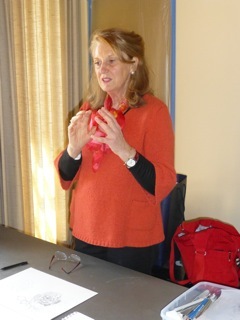 Jenny’s teaching always includes effective ways to achieve maximum effect with ease and her wit is always evident.